We've been trying to transition to using less chemicals and more natural products in our daily life. This was important to us before, but became even more so once we had Jake. His little newborn body was so fresh and untainted by man-made chemicals, we wanted to keep it that way! This week my head is on natural living because of the Natural Mothering E-Book Bundle, so I thought I would share five of our favourite natural products! We LOVE this stuff. It's been our shower soap for the last while, and it makes showering such a luxurious activity - even when it's only a 30-second shower with a toddler waiting for my attention! In our heads we call the scent brown sugar, because somehow it makes me think of melted butter and brown sugar. Luxury, I tell you. And with a list of all-natural ingredients on the website, and really affordable prices - this is the natural soap to get! It was Sara Elizabeth from A Mama's Story who saved the day for us when I was worried Jake was getting a cold but didn't know how to prevent it naturally! She suggested Elderberry Syrup, a natural remedy for boosting the immune system and preventing sickness. Since then it has been our go to whenever it seems Jake is starting to get sick and it has always seems to nip it in the bud! He hasn't got a full on cold once since we started using it. Also he LOVES it. It tastes like grape juice, but without that nasty cold syrup feel. We have been using Sambucol Kids Elderberry Syrup. We LOVE Norwex products. I am SO happy to be able to clean my house without dangerous chemicals, and save time while doing it too. I wrote a review here, about a month after we had been using them - and four months later I am just as impressed. The ones I use most are the kitchen products, and we probably talk about how great the dish towel is almost weekly. I had been dabbling in natural deodorants for a few years before marrying Andrew, but he was really uncomfortable with the idea of aluminum seeping into his pours. We were so lucky to have found a product that works for him on our first try - Burt's Bees Herbal Deodorant. Unfortunately, I think they have discontinued that specific product, and have replaced it with this one. We haven't tried it, but probably will once Andrew runs out. I use Tom's Lavender and have been really happy with it. It's a wonderful fresh scent, and it works! What more could you ask for? We just recently purchased this from Bulk Herb Store. It's a natural salve that you can apply to scrapes, burns, rashes - basically any skin issue. With Jake on the move, in a sort of wobbly-toddler way, his knees are seeing more scrapes and bumps than they have yet! So it's great to have something I can apply knowing it's all natural, and should help speed up the healing process. 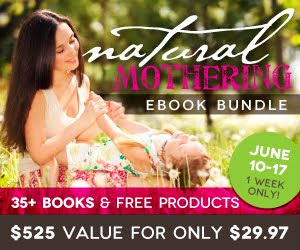 If you are interested in living a more natural lifestyle, I'd really encourage you to consider the Natural Mothering E-Book Bundle. 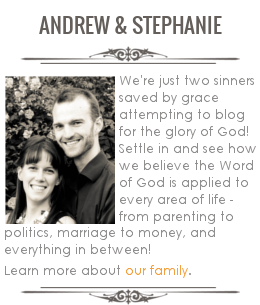 It is $529 worth of products for $30, and the sale ends this coming Monday! You can preview the 35 e-books and read more about it here. 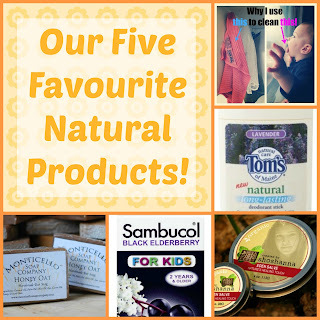 So there you go - our five favourite natural products! What are yours? Love, love, love Elderberry Syrup! I make my own, but I have used that brand in the past. It's very nice and works great! Visiting from Natural Living Link-Up.